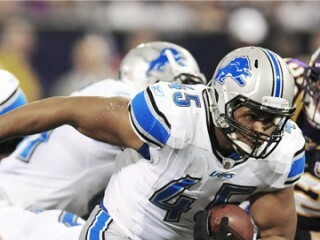 Jerome Felton is an American football fullback for the Detroit Lions of the National Football League. * Drafted by the Detroit Lions in the fifth round (146th overall) in the 2008 NFL Draft. PRO: The third-year fullback has contributed both as a lead blocker and a receiver out of the backfield and has appeared in 37 career games (15 starts). * Career tallies include 31 rushing attempts for 102 yards, 29 receptions for 236 yards and seven special teams tackles. 2010: Serves as the team’s fullback and on special teams. * Had 2 carries for 7 yards in season opener at Chicago (9/12). * Recorded 2 carries for 5 yards and a reception for 5 yards at Minnesota (9/26). * Kickoff return for 22 yards at New York Giants (10/17). * Returned a kickoff 37 yards against Washington (10/31) in the fourth quarter that set up Lions third touchdown of the game. * One catch for 19 yards and a carry for 4 yards at Buffalo (11/14). * Made first start of the season at Dallas (11/21). Carried four times for fourteen yards. * Had two catches for seven yards against New England (11/25). 2009: Team’s starting fullback. Registered 14 carries for 46 yards and 13 catches for 133 yards on the season. * Recorded a reception for a career-long 21 yards vs. Minnesota (9/20) and helped pave the way for 129 yards rushing on 34 carries. * Caught a single-game best three receptions for 23 yards at Chicago (10/4). * Caught a career-long 27-yard reception which moved the team into scoring position vs. Pittsburgh (10/11). * Tied a career-high with 12 rushing yards on 3 carries (4.0 avg.) vs. Arizona (12/20). Contributed to Maurice Morris’ 126 yard rushing effort. 2008: Played in 12 games (six starts) during his rookie season. Had 2 rushing attempts for 4 yards and 9 receptions for 52 yards. Also had 2 special teams tackles. * Made first professional career start in season opener at Atlanta (9/7). * Made first catch of professional career for a gain of three yards vs. Green Bay (9/14). * Caught season-high two passes vs. Chicago (10/5) for 12 yards. * Recorded career-long 11-yard reception at Houston (10/19). * Inactive at Chicago (11/2), vs. Jacksonville (11/9) and at Carolina (11/16) due to ankle injury. * Did not play vs. Tampa Bay (11/23). * Caught career-high 2 passes for 17 yards vs. Minnesota (12/7). Felton was only tackled behind the line of scrimmage 15 times during his career for minus 22 yards on 575 rushing attempts while scoring 63 times on the ground and establishing himself as Furman’s all-time record holder in scoring with 414 points. * Started all eleven games at fullback as a senior, leading the team with 165 carries for 705 yards (4.2 avg) and twelve touchdowns. * Invited to play in the East-West Shrine Game after the 2007 season. * Felton also excelled in the classroom, twice earning Southern Conference academic accolades with a 3.25 grade point average in Political Science. * As a junior in 2006, he was an All-Southern Conference first-team choice after playing in 11 games and finished second on the team with 707 yards on 162 carries, setting a school season-record with 23 touchdowns on the ground. * Shared Freshman of the Year honors with strong safety Andrew Thacker in 2004 having appeared in every game, starting in the last seven contests. Attended Sequoyah (Madisonville, Tenn.) and excelled as a fullback and middle linebacker, earning team Offensive Most Valuable Player honors three times. * Three-time All-County and All-Region choice, rushing for over 3,000 yards and recording over 300 tackles in his three-year career. * Served as team captain as a senior, rushed for 1,300 yards, and finished second on his team with 104 tackles. * Named All-American Scholar and an Outstanding African-American Student of Tennessee, in addition to receiving the 2001-02 United States National Minority Leadership Award. * Majored in Political Science at Fuhrman and had a 3.25 grade point average. * Two-time member of the Academic All-Southern Conference team (2005-06). * Took the ACT as a seventh grader as part of Duke University’s Talent Search program. Score was high enough to allow him to enroll in summer and night courses at Hiwassee College, where between 7th and 11th grade, completed 19 hours of college credit courses. * Mother, Sabrina Felton-Curtis, is a native of Germany and former professional gymnast presently serving as a science teacher at Hiwassee College (Madisonville, Tenn.). * His 15-year-old brother, Eamon, has already graduated from Hiwassee Junior College and is currently enrolled at Maryville College as a premed student. Other brother, Simon, is in the Army and currently serving in Afghanistan. * Professionally trained scuba diver and rescuer. * Born Jerome Jean-Marie Felton on July 3, 1986 in Duren, West Germany. View the full website biography of Jerome Felton.